Here's how to integrate Apigee functionality into your Android application using the Apigee SDK for Android. Sign in or create a new account if you do not already have one. You won't need it to install the SDK, but you'll need it to create apps. For more about Apigee accounts, see Creating an Apigee Account. After you've signed up, you'll see that you have a sandbox application to experiment with. For more information about that, see Using a Sandbox Application. Eclipse IDE or Android Studio: These are not the only way to write Android apps, but they include tools that make the job easier. You can download Eclipse Standard from the Eclipse download page or Android Studio at the Android Developer site. Android SDK: This includes tools for building Android apps. Download the SDK and install it. Java 1.7 is required to work with the Android SDK. Download the Apigee SDK for Android and expand the ZIP file. /lib .jar of the SDK to include in the build path of your project. /new-project-template A simple template project that already integrates SDK files needed to build apps that support Apigee features. /samples Sample apps that you can run to explore Apigee features. /source Source code for the SDK. Copy the jar file into the /libs folder in your project. In the Eclipse Package Explorer, select your application's project folder. Click the File > Properties menu. 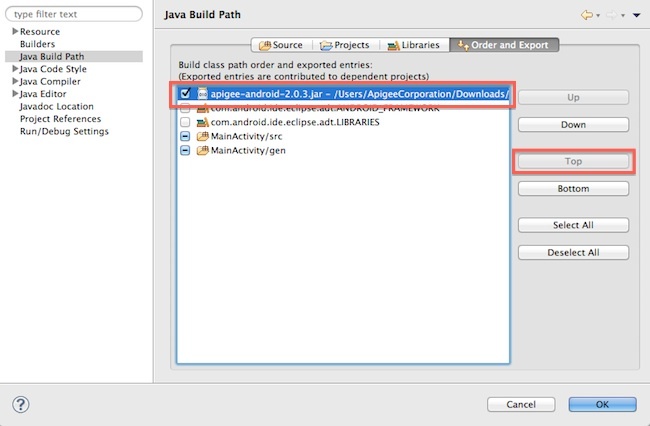 In the Java Build Path section, click the Libraries tab, click Add External JARs. Browse to apigee-android-<version>.jar, then click Open. In the properties dialog, in the Java Build Path section, click the Order and Export tab. IMPORTANT: Select the checkbox for apigee-android-<version>.jar, then click the Top button. If you are using Ant to build your application, you must also copy apigee-android-<version>.jar to the /libs folder in your application. If you don't have a project yet, you can begin by using the project template included with the SDK. The template includes support for SDK features. Add the following Internet permissions to your application's AndroidManifest.xml file if they have not already been added. Note that with the exception of INTERNET, enabling all other permissions are optional. Subclass the Application class, and add an instance variable for the ApigeeClient to it, along with getter and setter methods. // hold onto the ApigeeClient instance in our application object. This will make the instance of ApigeeClient available to your Application class. Once initialized, App Services will also automatically instantiate the MonitoringClient class and begin logging usage, crash and error metrics for your app. To verify that the SDK has been properly initialized, run your app, then go to 'Monitoring' > 'App Usage' in the App Services admin portal to verify that data is being sent. Warning: It may take up to two minutes for data to appear in the admin portal after you run your app. Use this object to access the data methods of the App Services SDK, including those for push notifications, data store, and geolocation. Use this object to access the app configuration and monitoring methods of the App Services SDK, including advanced logging, and A/B testing. Push notifications: Send offers, alerts and other messages directly to user devices to dramatically increase engagement. With App Services you can send 10 million push notification per month for free! Geolocation: Target users or return result sets based on user location to keep your app highly-relevant. Data storage: Store all your application data on our high-availability infrastructure, and never worry about dealing with a database ever again. User management and authentication: Every app needs users. Use App Services to easily implement user registration, as well as OAuth 2.0-compliant login and authentication. books An app for storing a list of books that shows Apigee database operations such as reading, creating, and deleting. messagee An app for sending and receiving messages that shows Apigee database operations (reading, creating). push An app that uses the push feature to send notifications to the devices of users who have subscribed for them.